Norse mythology is rich with meaning and symbolism carried down through the ages. 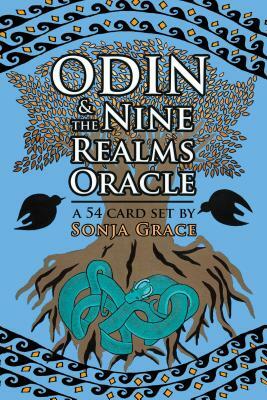 Diving deep into the profound wisdom of the Nordic traditions, Odin and the Nine Realms Oracle presents a unique divination tool created by mystic and healer Sonja Grace. Inspired by Sonja’s ability to communicate with the Norse gods and spirit travel back in time, this deck of 54 cards features the famed Norse gods Odin, Thor, Loki, and goddess Freyja alongside some of the lesser known but equally powerful deities such as Frigg, Rán, Tyr, and Baldur. The cards evoke the mysteries of the Nine Realms of Asgard, Midgard, Vanaheim, Jotunheim, Nlflheim, Muspelheim, Alfheim, Svartalfheim, and Hel. These nine worlds are held in the branches and roots of the great tree of Yggdrasil, the World Tree located at the very center of the Universe. Also depicted in these oracle cards are 24 runes, among them Gebo (gift), Naudiz (need), and Wunjo (joy), each one with a meaning and purpose that can stand singularly and in combination with other cards drawn from the deck. The cards touch on universal themes such as love, fear, purpose, power, medicine, and energy, revealing new insight into and understanding of the enigma of life. Each card’s illustration is based on a hand-drawn original by Sonja Grace, representing everything from the sacred waters of the Norse, to the dwarves, elves, giants, runes, and gods. The cards’ powerful imagery allows you to deepen your connection to spirit and discover the hidden meanings of both direct and reverse placements of the cards. The included book shows you how to work with a range of different spreads, giving clearer insight and divine guidance on single questions as well as on more complex issues relating to past, present, and future. Imbued with the knowledge and the power of a strong tradition, Odin and the Nine Realms Oracle can help clarify your path and provide guidance for your life’s unfolding.